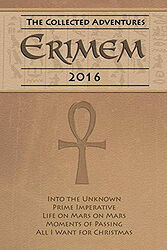 Note: Following Erimem: The Collected Adventures 2015, this is a compilation of the previously-published short story collections Into the Unknown and All I Want for Christmas, the novellas Prime Imperative and Buccaneer, the short story Home, originally published with Prime Imperative, and the short stories Life on Mars on Mars and Moments of Passing, both of which were originally published for free on the Thebes Publishing website, and making their first appearance in print here. For reasons best known to the publisher, neither Home nor Buccaneer are listed on the front cover, though the rest of the contents are. Daughter and heir of Pharaoh Amenhotep II, Erimem left Egypt to explore and learn but she is drawn through space and time to London in the Twenty First Century. With a new group of friends and the ability to travel the universe, Erimem's travels take her from Earth's past to distant worlds in the far future. Facing pirates, monsters, space plague and the horrors of Christmas, Erimem's adventures have only just begun. 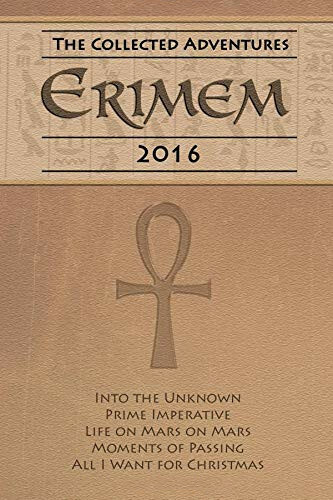 This collection contains the Erimem novel, novellas and short stories first published in 2016.